You won’t want to miss the longest running hang gliding competition in the world hosted right here in Nags Head by Kitty Hawk Kites. The 47th Annual Hang Gliding Spectacular will take place May 16th – May 20th, 2019 at Jockey’s Ridge and since it’s free to watch the events, you should definitely come out! Several competitors are brought to NC to compete in events like the Dune Competition where competitors attempt to land in the center of a target, and the Aero Towing Competition where pilots compete at spot landing, duration, altitude and a bean-bag bomb drop. Seminars and hang glider demonstrations are ongoing during these events. The Tri-State Cross Country & Airtime Contest hosts hang gliders and paragliders from VA, NC and SC who compete for XC classes. Category leaders from the annual contest will be handed out for the 2019 season at the Spectacular as well. There is also a fun event outside of the Nags Head Kitty Hawk Kites store known as the Woody Jones Memorial Street Dance in which a live band performs for a night of fun and dancing. Jockey’s Ridge State Park a 426-acre park comprised of the tallest natural sand dune on the East coast making it the perfect place to host the Hang Gliding Spectacular. From sightseeing to kite flying, visitors love coming to Jockey’s Ridge to learn about the ecology of the area while enjoying the views at the top that stretch from the Atlantic Ocean to the Roanoke Sound. A visitor center and museum are on site along with trails, picnic shelters, and an auditorium. If you’re here for the week, there is plenty to do while you’re not at the Spectacular including exploring Nags Head Woods, visiting Bodie Island Lighthouse, or casting your line off of the Nags Head Fishing Pier. Check out our Nags Head local area guide for a list of more activities and great dining options. 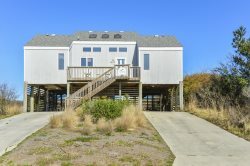 Seaside Vacations has some awesome rental homes in Nags Head near Jockey’s Ridge so you won’t be far from all the fun of the Hang Gliding Spectacular. If you’re planning a shorter trip, we have several homes offering Any Day Stays which means you get to customize your vacation! Parking: There is a huge parking lot at Jockey’s Ridge State Park including parking for trailers and handicap spaces. Bathroom Facilities: Various restroom facilities located on site. For more information, visit https://www.hangglidingspectacular.com.